You know the story. Your team returns from a tradeshow with a bunch of hot leads. They plan to follow-up on the leads, but they’ve been on the road for several days. Work has piled up while they were gone. Days, even weeks pass before they start lead follow-up. In the interim, all those hot new leads sit there, growing colder by the day, losing value and losing ground to competitors who have already begun following-up. This scenario is familiar for far too many exhibitors. Exhibition industry research finds that 87% of tradeshow leads are never effectively followed-up. One of the reasons for this is not having a lead follow-up plan in place before the show. 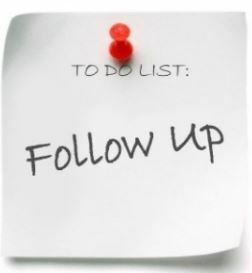 Waiting to develop your lead follow-up plan until after the show slows down follow-up efforts and ultimately costs you business. On the other hand, fast lead follow-up creates a competitive advantage and gains business. Here are five steps to help you develop a lead follow-up plan before the show. Step 1. Determine what type of leads you are likely to get. Leads have many different shapes. It’s a current customer with an add-on or cross sell opportunity. It’s a prospect already in your sales pipeline that advances to the next step in your sales cycle at the show. It’s a brand new prospect you found at the show. The thing they all have in common is that they have value. Knowing what types of leads you are likely to get makes designing a lead follow-up plan easier. Do they have an application, need, problem or opportunity? Are you talking to a decision maker or influencer? An A lead matches up perfectly on all four criteria, B leads match up on two or three, and a C lead may only match up on one or two of the four criteria. Step 3. Create a lead qualification process and capture tool. Your lead qualification process provides exhibit staff with the key qualifying questions they need to ask, in the order they need to be asked. Pre-show staff training with role playing is priceless. Your lead capture tool should provide prompts with the questions and space or data fields to capture the answers. You might use a customer paper lead form or better yet rent the show’s lead capture system and create custom qualifiers. Step 4. Develop follow-up tracks based on lead priority. For each priority determine a follow-up track that identifies the follow-up media and the timeframes. Here’s an example for an A lead. Step 5. Write template follow-up letters, emails and call scripts. To complete your follow-up plan, simply write a template thank you note, a cover letter for the information mailer, possibly draft a phone script, and create the needs assessment questionnaire and/or protocol. If you can schedule the follow-up track in your CRM system and have the letter, emails and phone scripts available as templates, your sales team can hit the ground running right after the show. This entry was posted in Tradeshows and tagged Lead Management.